If you are a U.S. citizen or green card holder who lives outside of the U.S. for 330 days during any period of 12 consecutive months, you may be able to apply for the Foreign Earned Income Exclusion. This allows you to exclude from your taxable income a certain amount of income that you earn abroad. The exclusion amount changes each year as it adjusts for inflation. For 2017, the amount is $102,100. So, if you live abroad for 330 or more days in 2017 and earn under $102,100, you may not have to pay taxes. This exemption is not automatic and you must apply for the exclusion. Check the IRS website for more details. Keep in mind that even if you don't owe any money, if you meet certain income and status requirements, you are still required to file a U.S. tax return every year. 2. Medicare doesn't cover you outside the U.S. The first thing to be aware of is that, except in rare instances, any medical expenses you incur when you're not in the United States cannot be paid for with Medicare. That said, it may still be worthwhile to sign up for Medicare Part A (hospital coverage) because it is free. If you plan to move back to the U.S. or make frequent trips back, it may also be worth paying the premium for Medicare Part B, which covers doctor visits and outpatient care. To determine whether this will be of benefit to you, you should thoroughly check the information provided on the Medicare website. Even if your monthly income remains the same, the amount that this translates to in your local currency may go down. This is entirely dependent on the strength of the U.S. dollar at any given time, which could have a large impact on your finances, particularly if you're on a fixed income. You can still receive Social Security payments in most countries around the world but it's important to check the list of excluded countries before settling on a location. 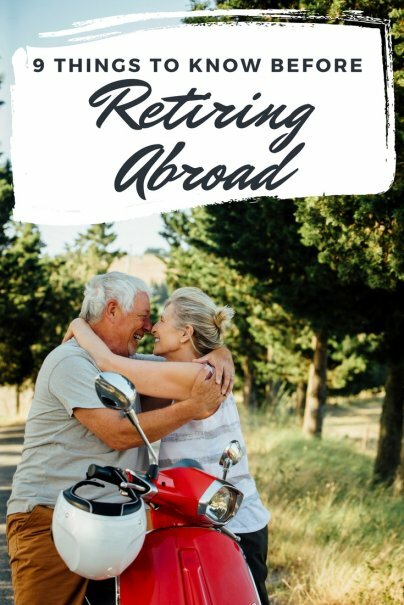 If you've lived and worked abroad for part of your career, you may also be able to combine retirement credits from the U.S. and another country where you worked, for a larger benefits payout. The other country must be among more than two dozen that has a reciprocal agreement with the U.S. There are two main considerations for putting a plan in place for the event that you pass away while you're abroad. First, you should know that the U.S. State Department will not pay for the return of your remains or ashes. Second, different countries have different regulations around what happens to your assets. You need to have funds in place if your wish is to have your remains repatriated to the U.S., as this can be a costly and time consuming process. You should make yourself familiar with local succession rules, as some countries won't automatically honor your wishes for assets that lie within them unless you have an eligible will. 6. You can probably still vote in the U.S.
Just because you no longer live in the U.S. doesn't mean you don't take an interest in the U.S. political situation. In the vast majority of circumstances you are still eligible to vote absentee in federal primary and general elections. In some states, you're even able to vote for state and local office candidates and referendums. You will need to submit a new Federal Post Card Application each year in order to qualify, and you should do so at least 45 days before an election. But from there it's a simple process. You'll be able to submit your vote either by mail or electronically depending on where you're registered. Unfortunately, the reality doesn't live up to the dream for some retirees relocating abroad. There are so many factors to consider that it's almost certain that issues will arise that you've not even thought about, from financial problems to culture shock. It's best to try a place out for a while before taking the plunge and relocating your whole life. Even if it's a location you know well from having visited over the years, residing somewhere permanently is different from vacationing there. Just bear in mind that it may not work out as you hoped. When it comes to calculating just how much it's going to cost you to live in a foreign country, it's important to include relocation costs. Shipping possessions like furniture can be costly, but not transporting them may also be expensive if you have to buy new items when you arrive. If you have pets there may be vaccinations and quarantine periods that you have to shell out for, as well as separate transport costs. In addition, your own visa application could be expensive and complicated depending on the location. Look out for those hidden costs. It's stating the obvious, but no matter how familiar the country is that you're retiring to, things will be different from the U.S. Everything from the local customs, to what groceries you can get in the supermarket will be new. You'll more than likely be away from close friends and family and there will probably be a sharp adjustment period. It's important not to underestimate the effects this could have on your happiness when making what will be one of the most significant decisions of your life.